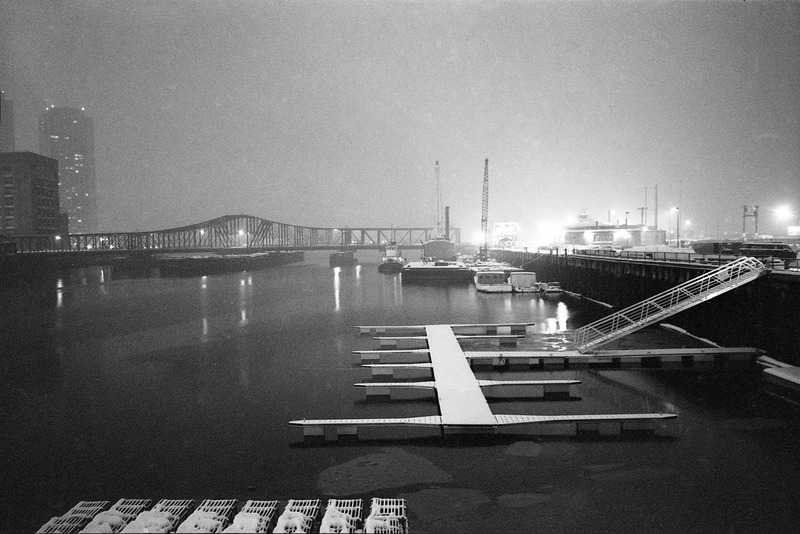 The gallery at 249 A Street presents a show of work inspired by the Old Northern Avenue Bridge and its bridge tender's house. The Old Northern Avenue Bridge, built in 1908, is the last remaining industrial swing bridge in Boston. It spans the Fort Point Channel at the mouth of Boston Harbor. The bridge was designed by Boston's Chief Engineer, following his tour of drawbridges in England. Although it was designed for freight trains, a local political dispute resulted in it being used for other vehicles. The pedestrian walkways to the side were added in later years. Bridge openings were initially operated by steam engine, but later changed to electric motor. The bridge tender's house (beside the bridge) is badly deteriorated, and its associated pier fields and deckings were removed in recent years. The bridge was closed to vehicular traffic in 1999, and functioned as a pedestrian crossing until December 2014, when it was closed to all traffic due to structural concerns. These concerns were first noted over a dozen years ago but no significant structural repairs were made. The City of Boston is currently exploring various plans for the future of the bridge, ranging from restoration to demolition and replacement. Over the years the bridge has been an inspiration to many artists. The Gallery at 249 A is pleased to present this juried exhibition celebrating the bridge and its adjacent bridge tender's house. The show includes photography, painting, drawing, and ceramics. Since 2002, Susan has been committed to creating opportunities for artists. As art consultant for the Massachusetts Convention Center Authority (MCCA), she launched the first convention center rotating art exhibition program in the nation. After working with a number of non-profit organizations, including FPAC, and serving on many committees, she is taking some time to work in her studio as an oil painter. Gallery At 249 A Street features rotating art exhibitions and special arts events. The space is an evolving project of the 249 A Street Cooperative, one of Massachusetts's first limited-equity live/work cooperative for artists. The building, which is home to more than 45 artists and their families, has served as a model for artists' housing nationwide and was key in the growth of the Fort Point Arts Community (FPAC). Gallery At 249 A Street was the home of the FPAC Office for its first eleven years. The 249 A Street Cooperative celebrated its 30th anniversary with the opening of this new gallery space in September 2014.